I'm not a fan of plastic tray ready-meals, I think I ate too many of them at university. That said my ex-room mate used to swear that the Marks & Spencer ones were actually quite nice and in the later years he practically lived off them. I'm quite willing to believe that 15 years later the technology for plastic tray ready meals has advanced to the point where they no-longer taste of cooked plastic and actually have proper ingredients. I was more than happy to put this to the test when I got bought the above Spanish themed pot. It's decently large, and mostly rice with some chicken and a few fat slices of Chorizo sausage on top. I oven cooked it to give it a fighting chance (the microwave always seemed to make these less appetising) and had it as a main meal. 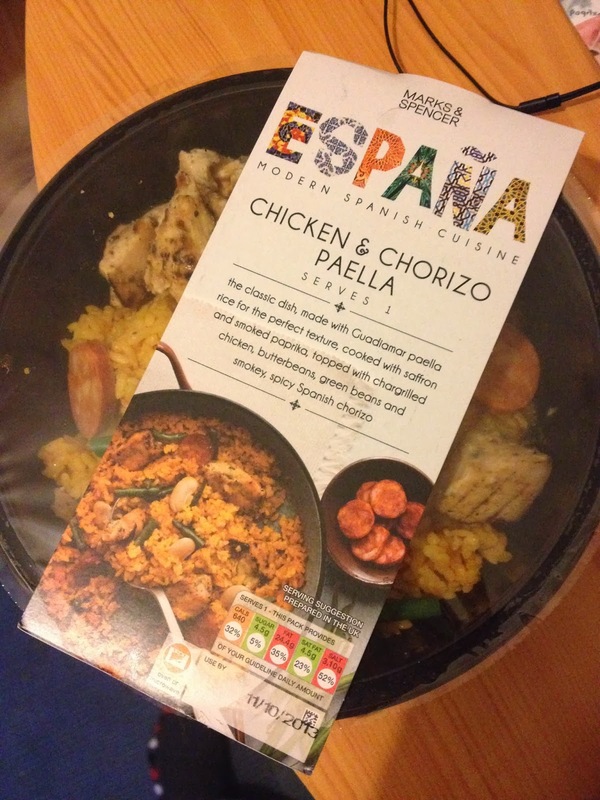 Despite the box suggesting that authentic Spanish people let the bottom burn a bit for crispiness I decided that doing it for roughly the right amount of time would be wiser as a decent review test. The proportions of the ingredients were fair, you got a decent normal person portion of the chicken and sausage. The rice and vegetables were crisp enough to be appetising, and had noticeable flavours. The sausage was the main taste and the mouthfuls with this were the ones that made this a pleasurable experience. The chicken had a nice flavour too, but I'm a fan of the strong stuff. I could have happily doubled the amount of sausages in this, but then I could have probably just sat and ate chorizo instead of having a balanced meal. As this is a quick and easy thing to do I can imagine picking one up to microwave when in a rush, or when out and having limited resources such as at work for lunch. I'm not sure it's a regular evening meal that I'd plan for, I'd much rather spend the 25 mins making all the bits. That said the flavour here was pretty similar to when I had this in Spain, which is something I've never quite got right. I think that for someone that enjoys Spanish food this is a nice treat. I wonder if M&S sell the individual bits that I could use to make the meal?